Pre-drawn concept map symbols represent rectangle, square, rounded square, ellipse, connector, dynamic star, etc. These symbols help create accurate diagrams and documentation. 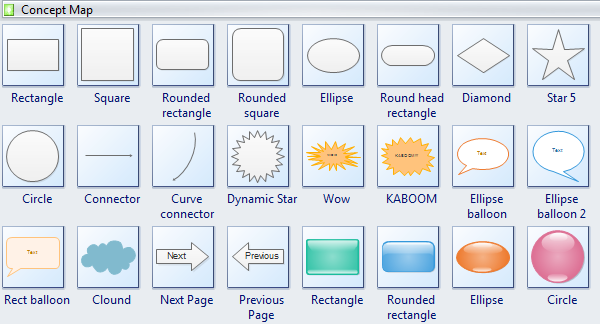 Edraw software offers you plenty of concept map shapes including rectangle, square, rounded rectangle, rounded square, ellipse, connector, curve connector, diamond, star 5, circle, dynamic star, ellipse balloon, previous page, rectangle, rounded rectangle, circle, etc. All these shapes will be good assistants for you when drawing the concept maps. Concept map is often used as one way to summarize understandings acquired by students after they study a unit or chapter. Concept map symbols are of great importance for drawing concept maps. The picture below is the concept map symbols in our software. Edraw concept map shapes contain many kinds of special shapes like rectange, square, rounded rectangle, rounded square, diamond, star 5, circle, etc. Next page and previous page signs are respectively used to point to next page and previous page. Need fresh looking concept map symbols for your design? These concept map symbols are a cinch to pop in. And their crisp, fine detail will make spectacular, easy-to-understand diagrams and presentations to your customers.